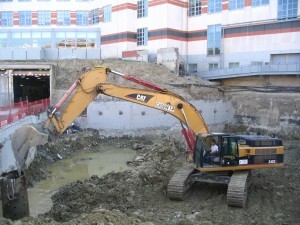 Basement excavation should be always supervised by an experienced contractor. This procedure is usually performed by a basement excavation company, because it can be complicated as well as labor intensive. There are numerous specialty companies who focus exclusively on basement excavation and they can be a good choice for this type of a project. They can involve other companies to make the process as efficient as possible. Homeowners or General Contractors should be aware that a building permit is generally required prior to excavation work and a building inspector will want to visit the project site to make sure that safety measures are being followed. From squared and levelled lines plumb down for the excavation process. Cut a 2×4 to the length of basement depth from grade level to basement floor allowing for the thickness of the slab on grade as well as under-slab insulation and any gravel or sand layer. All dept h measurements for footing strips, walls, piers, etc., are to be taken from grade level. Leave a sloped approach at one end to draw out the dirt. This sloped approach is later excavated by hand. The building site must be prepared, clean and well organized. Clear all excess building materials and debris away from the work area. If you have a below grade basement, make sure that the excavation is clear and that you have good access all around the perimeter. A minimum clearance of 3 feet is recommended. 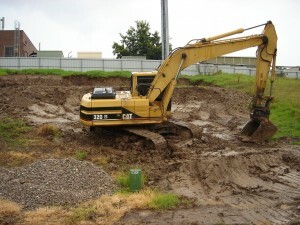 Provisions for a sub-surface drainage system should be made for later installation. Meet and coordinate with the excavator before work commences and stay in touch as the excavation continues. Dig only where needed and never over-excavate!